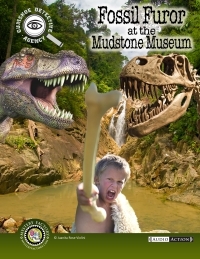 Fossil Furor Kids Mystery Party will have your youngsters digging up dirt on who stole the Famous Finnegan Fossil from the Mudstone Museum. Catch the thief and return the fossil before Billy’s family home gets turned into a toxic waste dump.v Listen to the robbery as it happens! It's a party in a PDF, with everything needed for a first-class event for home parties, library fun time, or summer camp. An Audio-Action mystery with the crime recorded live on an audio clip! Codes & clues included.